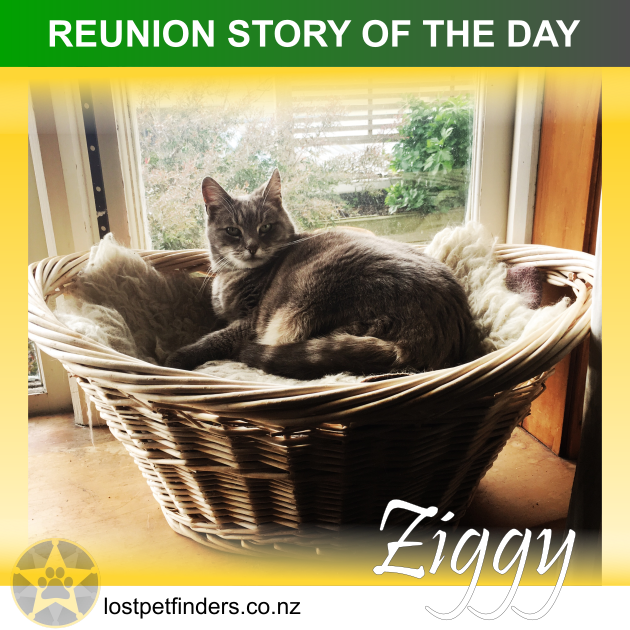 "Ziggy came into my life as a young cat: she lived in the house that I bought when I moved to Dunedin. I fell in love with her the first time I saw her -- and I'm sure a big part of my buying the house was knowing that she would continue to live there. When I moved in, Ziggy was called Ciggy (short for Cigarette) -- a cruel name, I thought, and I gently changed it to Ziggy so that she would still recognise the sound. Ziggy Stardust. When I moved in, Ziggy was in huge distress. The previous owner had left 2 weeks earlier and just left her alone in an empty house. And then 3 weeks later she unexpectedly had kittens. Pearl is one of those kittens. It took Ziggy a long time to recover from the ordeal of abandonment: for the whole first year of us living together, she didn't purr. And then one day the purring came & she's been a happy and settled cat ever since: the most gentle of creatures & welcoming of every new human walking into her life as another potential source of love and comfort. On Thursday night I came home after work and she wasn't there. I knew immediately that something was wrong because they're usually both waiting for me when I get home. I tried not to overreact and give it a few hours, but looked carefully around the house & kept calling her around the property. I finally went to bed at around 2 am, hoping that she'd find her way home overnight. When she wasn't there the next morning, I knew something had happened & I started looking in earnest: knocked on every door in the neighbourhood. I got very few leads apart from one neighbour saying that there was a distressed stray dog in the street the day before, and so maybe he had chased Ziggy. I rang & visited the local SPCA but they were closed for Easter. Then printed flyers & put them all around the neighbourhood. A random stranger gave me a hug when I cried as I put up the "Missing" note at the local shops. A friend came to keep me company as I tried to get my head around this sensation of a sudden loss, and the fear that she was out there suffering & I couldn't get to her to help her. I kept walking around the neighbourhood calling her name -- my Fitbit tells me that I climbed 92 floors yesterday! (I live in a hilly area.) At night, I went online & posted the note in the Dunedin News list on Facebook, and from there was referred to the "Lost and Found Pets" site, the SPCA Otago "Lost and Found" site, as well your site. It was crucial to have this support at that time: it offered a forum to connect with others going through the same process ... to get words of encouragement & suggestions for what else I could try -- and mostly just not feel so horribly alone and helpless in this process. After another fitful sleep I woke up thinking that it would be better if Ziggy was dead than suffering, and that if she had died, I hoped it was a quick death without too much pain. And just then she walked through the door. She was spooked and hungry (though curiously not thirsty), but seemed otherwise unharmed. Now the family is happily reunited & they're both snoozing after a big feed -- the household is in recovery mode!! For everyone going through this experience: it's truly horrid! It triggers so many fears of loss & pain ... but don't give up hope! I had a really bad feeling about this because Ziggy is such a home-body who never strays -- but she would have been spooked by something & did what she could to keep herself safe.